Our recession predictably continues to be one in which real gross domestic product and spending outperform the labor market. This pattern differs from the 1980-82 recession and suggests that public policy could be doing a better job this time of raising employment. At this time a year ago, with the three quarters of G.D.P. data that was available, I explained how this recession had followed a pattern described decades ago by Paul Douglas, the senator and economics professor. Professor Douglas said that a labor crisis would hurt spending but only in a ratio of 7 to 10. That is, for every 10 percentage points that employment and hours worked fell, total output and spending would fall 7 percentage points. Equivalently, one side effect of a labor crisis would be to raise employee productivity and real hourly wages, because productivity is the ratio of output to labor. Since then, four more quarters of data have become available to further test this theory. 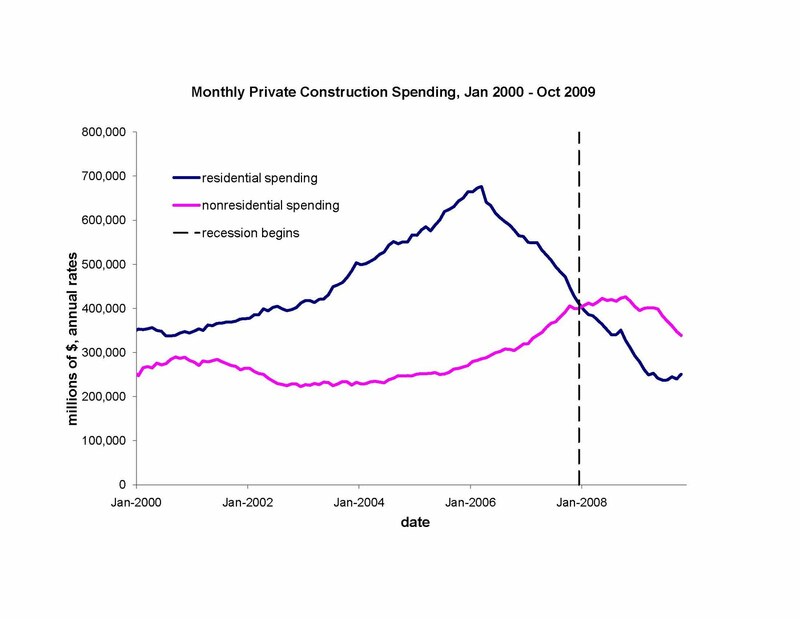 From the fourth quarter of 2007 to the third quarter of 2009 (the most recent quarter with data available, and some say the trough of the recession), employment and hours worked fell 8.6 percent, while real spending and output declined 5.8 percent (both relative to trends). By definition, the fact that real G.D.P. 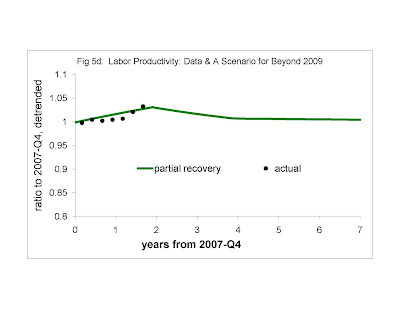 performed better than labor means that productivity rose. As a result, we expect hourly labor costs (that is, the amount employers spend on payroll and benefits for each hour that employees work) to have risen too. 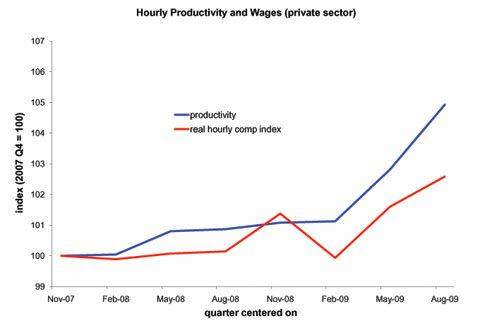 The chart below displays private sector productivity and real wage series for this recession. Both rose a couple of percentage points, especially over the last year. Many readers of last year’s article thought that it was only obvious that real G.D.P. should fall less than employment — employers, they said, would force more work upon the workers who kept their jobs. Employers may in fact be acting this way (although why are they paying more per hour? 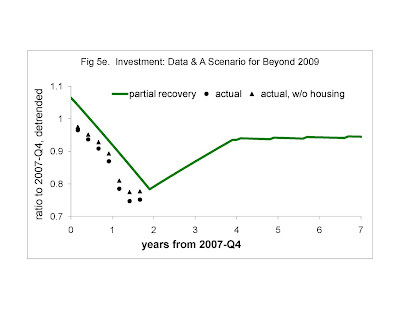 ), but this pattern is not found in all recessions. During the 1980-82 recession, which has often been compared to this one, real G.D.P. and spending fell significantly more than employment and hours. Many economists would agree that the causes of the current recession are different than in 1980-82, and that some of the differences can be seen in the productivity data. Some would say that high real wages are part of the problem — that employers would be hiring more if labor were cheaper. If that’s right, public policy so far in this recession seems to have gone in exactly the wrong direction by raising the minimum wage and otherwise increasing employment costs. Job hires have been low in recent months, but that does not necessarily mean that spurring hiring at small businesses is the best way out of this recession. It is sometimes said that helping large employers can prevent mass layoffs, whereas helping small employers can stimulate new hires. If so, it might be important to know whether the job losses during this recession have come from a surge in layoffs or a collapse of new hires. 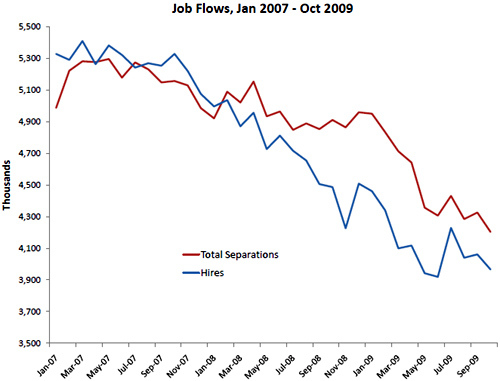 The chart below displays monthly new hires and job separations from January 2007 to the latest month available, October. New hires indicate the number of people newly employed with their employers; promotions and transfers are not included. 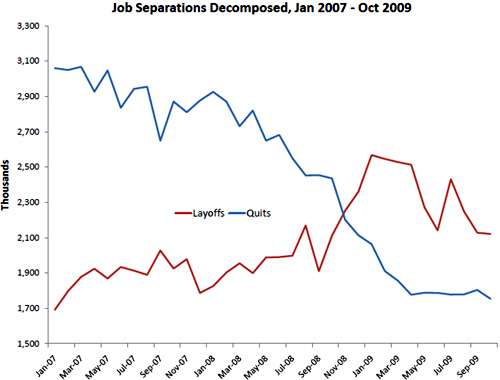 Job separations indicate quits, layoffs, retirements and deaths. The monthly flows into and out of employment are large: Millions of people find a job every month, and millions lose a job. The fact that separations have consistently exceeded hires for over a year explains why total employment has fallen by seven million since the recession began. Job separations have been lower during this recession than they were before the recession began, as was the case in the 2001 recession. Employment has dropped because new hires have fallen even more. For this reason, some have argued that the key step to raising total employment is to spur job creation by small business, because layoffs are not the problem. But if you look at the individual components of separations, you will see that a couple of other conclusions are also credible. Thus, a surge of layoffs — rather than a collapse in hiring — could well have made this recession as bad as it ultimately was. Moreover, the collapse of hires need not have been the driving force over the last year or two. The chart above shows how quits collapsed. To the extent that many new hires occur in order to replace workers who had quit, the collapse of new hires shown in the first chart could well be a response to the collapse in quits shown in the second. The fact is that the various job flows are all interdependent on one another: Quits create hires and prevent layoffs, the prospect of new hires can motivate people to quit, and prior quits and layoffs can create new hires as more labor becomes available for firms aspiring to grow. Although public policies that support small business may help end this recession, the case for such policies cannot be made from the job flows data alone. Smithie Adams has been a recreational hunter: the occasional deer, duck, or rabbit. His basic approach has been to aim his rifle at the intended target, shoot, and hope his hand was steady enough. This season he went hunting with PK, rumored to be a world expert. PK offered this advice. "Today is the third Friday of the hunting season, in a year with that is a prime number minus two. On such Friday's, betweeen 11:15 and 11:30 Greenwich time, you cannot hit your prey by aiming your rifle at the target. You will hit your target by aiming your rifle at yourself!" Smithie Adams aims at himself and fires? Smithie Adams says, "I'll take a break from hunting until after 1130." Smithie Adams laughs and says "PK, clearly you have another agenda!" not be doing my job. PS Feel free to post this if you wish." I totally agree with Professor Mankiw's thinking about competing groups. People voluntary join groups that impose rules, and have the option to join some other group with an alternate set of rules. For example, I chose to become a grad student at the Univ of Chicago instead of a grad student at Harvard. But I guess we remember 1989 a little differently. I read today how Professor Mankiw will not share his lecture notes with finalsclub.org because "he didn’t want to make it easier for students to cut class. 'Listening to lectures and taking your own notes is part of the educational process.'" That reminds me of my own enrollment in his Ec2010c course in Autumn 1989: he tried to expel me! Ec2010c is a graduate course, and I was the only undergraduate there. Early on I learned about structure of the course, grading, etc., and determined that I did not need to complete all of the problem sets, should not participate in any of the "study groups," and might even skip a lecture or two (not many -- attending was quite productive). I would hone in on the material in December and early January, in preparation for the mid-January exam (and perhaps along the way object to some of the dubious conclusions of New Keynesian economics). Professor Mankiw knew nothing about me, but decided that my approach (whispered to him by then TA Susanto Basu) was harmful to me and perhaps even the other students, so that for the common good I should be expelled from the course. His reaction always puzzled me, because he's a friendly person and usually appears to be libertarian. But now I see that he does take a paternalistic role toward the students. By the way, I was not expelled from the course because the other TA (Xavier Sala-i-Martin) and the other Prof (Barro) requested that I be allowed to remain. Among about 50 grad students, I got the second highest grade on the final (and only) exam in the course. Since 1989, it has been more common for a couple of eager undergrads each year to enroll in 2010c. Gullible New Keynesians? Or Tax Collector Windfall? Long before Adam Smith, people learned that incentives matter. If a person cannot keep enough of the fruits of his efforts, he will not put forth the effort in the first place. Kings, emperors, sharecropper landlords, treasury secretaries, slave owners, and many others over the ages understood that they maximize their tax collections by limiting their tax rate to something less than 100 percent. Even the so-called Communist Chinese government appreciates this. An economy with excessive tax rates will necessarily be an economy that produces far less than its potential, and ultimately produces little revenue for its tax collectors. This impeccable logic, supported by centuries of experience around the world, includes nothing about “interest rates,” nothing about the “Federal Reserve,” and nothing about the “zero lower bound.” In the grand scope of human experience, the Federal Reserve (a U.S. institution that was absent for most of its history) is at most a minor footnote. Yet now a few New Keynesian economists are telling us that hiking tax rates raises income and labor usage (sic). Their logic hinges critically on an esoteric theory of the Federal Reserve. Without evidence, they believe, and would have you believe, that the Federal Reserve’s situation can turn the impeccable logic of incentives on its head. [Hereafter, for brevity I refer to those making this argument as “New Keynesians”, but please recognize that many New Keynesians such as Professor Mankiw are not so gullible as to conclude that incentives don’t matter. For now, I am not naming the gullible, in order to give them more time to pause and see the big picture]. That incentives matter is not just a microeconomics point. If you have a large group of people (members of a kibbutz, citizens of the Soviet Union, etc. ), each of whom has little incentive to work, the aggregate result for the group will be low output and low living standards. The point that incentives matter in the aggregate seems so obvious, but the recent debate about them requires that we revisit each of the logical steps. Suppose that something happens at the individual level to reduce the supply of labor. An increase in personal income tax rates, or an increase in unemployment benefits, are examples. New Keynesians agree with me that, say, an unemployed individual enjoying higher unemployment benefits will be less willing to accept a low paying job. Or that the substitution effect of a higher personal income tax rate is to cause people to put forth less of the effort that produces that income, unless the rate hike were offset by higher pre-tax pay. As each individual supplies less labor, wages rise as employers compete for the smaller labor pool. We usually say that the prices of the goods produced by those employers would rise with wages, or that employers would take other steps (suspending advertising, sales, discounts, reducing product quality, etc.) to reduce the volume of goods they deliver to customers (after all, the wage increase is reducing the profit they earn from delivering each unit). This process may not be exactly as in the undergrad textbook – that is, volume may react a bit less (or a bit more) than it would if prices increased one-for-one with wages – but the basic point is that higher costs ultimately and significantly reduce production and sales. 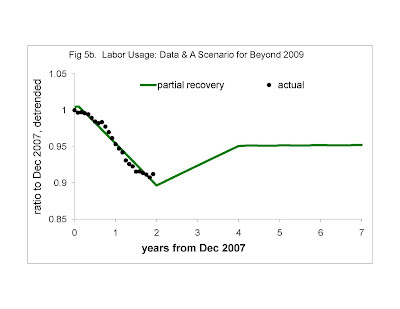 So the macro story, as most economists understand it, ends with less labor usage and output. And the basic conclusion that higher costs reduce production has been supported by decades of experience and economic measurement. Nevertheless, the New Keynesians depart from me at this point. They say that, in response to higher wage costs, employers/producers will do essentially nothing in the short term to raise prices or otherwise reduce their production and sales. In the longer term, employers/producers will pass on their wage costs to costumers, and those costumers understand that they must buy now before the producers can adjust. This extra spending by the customers actually induces employers to produce more in the short run, and thereby employ more in the short run. Thus we have quite a miracle. A greater tax on personal income increases aggregate income (even if the revenue from that tax is given back to taxpayers), because they have an individual incentive to earn less! A tax rate cut would reduce income. The logic is the same: tax cut --> more labor supply --> lower costs and anticipation of lower prices --> less spending --> less production and labor usage. Like encounters with aliens, the New Keynesian miracle is said to occur in only specific situations when the skeptics happen to be looking elsewhere. Normally, they say, the Federal Reserve would respond to the labor supply shock by adjusting the nominal interest rate. When something reduced labor supply at the individual level, the Federal Reserve would normally raise the nominal interest rate to choke off the additional spending that would otherwise appear in the New Keynesian story. When something increased labor supply at the individual level, the Federal Reserve would reduce the nominal interest rate to encourage the spending that (in the New Keynesian story) consumers would otherwise hold back until prices fell. That’s where the “zero lower bound” comes in – it supposedly prevents the Federal Reserve from reacting in this last step. 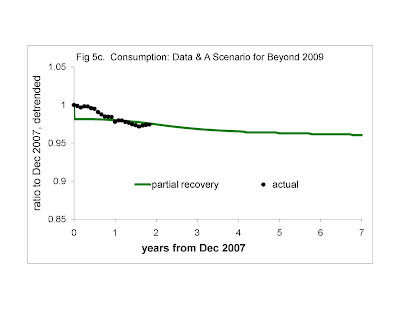 For this theory, it doesn’t matter whether the interest rate were stuck at zero, one, two, or ten. Nor is the “reason” for the interest rate’s being stuck relevant. The critical assumption is that nominal interest rates do not adjust in reaction to a shift in labor supply. To recap, New Keynesians tell us that income and labor usage increase when something reduces labor supply at the individual level, as long as the nominal interest rate does not adjust upward. This miracle is exactly what centuries of tax collectors have dreamed about. They could take a larger share of the economic pie and in doing so make the pie grow! All they have to do is make sure that the nominal interest rate cannot adjust upward. That leaves us with the question. Is it a great misfortune of history that the New Keynesian miracle was not discovered until 2009? Or have tax collectors over the years understood what New Keynesians do not: incentives matter, regardless of whether there’s a Federal Reserve, and regardless of the details of how nominal interest rates adjust? 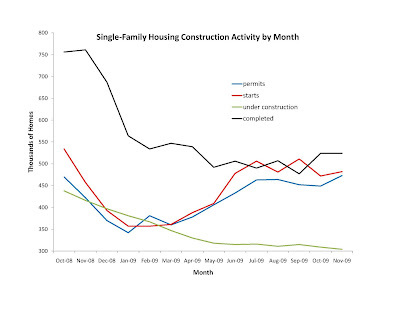 Some people thought they saw a trend toward less construction in the October housing construction data. 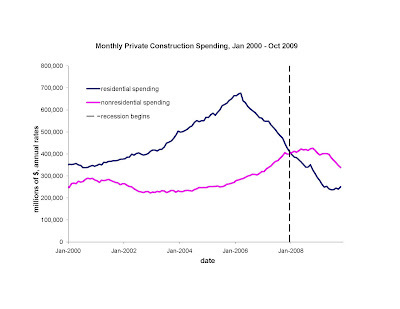 Now that the November housing data is out, we can revisit that claim. I don't detect a trend. Who Studies Near-Zero Interest Rate Economies? Professor Krugman has repeatedly emphasized that little of what we understand from past business cycles applies today, because (so he says) interest rates are near zero today. He concludes that the only useful studies are those of other eras of near-zero interest rates, and as a result one can ignore what Professor Barro, Mankiw and I (and anyone else who uses "traditional" economics) say about government policy. First of all, he has presented no evidence that a low-interest rate economy responds differently to fiscal and regulatory policy, while we have plenty of evidence that fiscal and regulatory policy are having very much the same effects as they always do. Professor Krugman's remarks contrast starkly with my JPE paper "Extensive Margins and the Demand for Money at Low Interest Rates", which empirically examines the extent to which "normal" economies respond to shocks differently than low-interest-rate economies, rather than assuming that low interest rates necessarily transform those responses. Even if we accept on faith that only low-interest rate economies must be studied, then one has to pay more attention to Barro's and Mulligan's studies, rather than less, because those studies have been conducted on economies with nominal interest rates at least as low as today's. The chart below shows the yield on 3-month Treasury Bills by year 1937-47 and 2005-15. Year is measured vertically and nominal yields are measured horizontally. 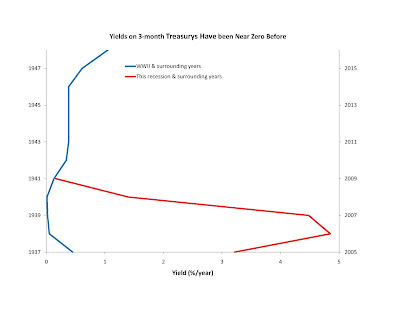 Thus, near zero yields are seen on the left border of the chart. As you can see, yields were at least as low during the episodes studied by Barro and me as they are today. For example, the average yield in 2009 was about the same (just a bit higher; shown by the red curve) as the average yield in 1941 (shown by the blue curve). For years, Professor Barro's Macro textbook has used World War II to estimate a government spending multiplier. (He and Charles Redlick have recently revisited WWII, and other U.S. defense spending episodes). I have looked at the labor market during World War II. Both of us looked at the expansion of government circa 1941-42 and the contraction of government 1946-47. Interestingly, Professor Barro and I have done vastly more work on low interest rate economies than he has, despite the fact that he is the one so fascinated by them. I guess the conscience of a liberal is not without its inconvenient truths. Some economists have been recently discussing a “paradox of toil,” meaning that an increased willingness to work actually depresses the economy. But evidence from this recession clearly shows that the paradox of toil is of little practical importance. This paradox of toil is of interest because it turns standard economics on its head, and helps rationalize the view that active fiscal policy can boost the economy even while it reduces incentives to work. Professor Krugman and other fiscal stimulus advocates tell us that the paradox of toil describes our economy during this recession. Fortunately, the relevance of the paradox does not have to be taken on faith, but can be examined with data from 2008 and 2009. For example, if the paradox described this recession, then the expansion of labor supply that occurs at the beginning of every summer as students become available to work would lead to lower employment. Or on the other hand, an increase in the minimum wage would increase employment as it raises prices and costs and leads to inflation. In fact, the 2009 labor market reacted to these events in the conventional way, with no paradox. When school let out for the summer of 2009, teenage employment increased by over a million, and total employment increased by about 700,000 (these May-July comparisons are necessarily seasonally unadjusted, because the school year is part of the seasonal cycle). The expansion in labor supply did not reduce total employment, as Professor Krugman would have us believe would have happened in a “paradoxical” year like 2009. Total employment expanded seasonally as it did in previous years. The federal minimum hourly wage was increased from $6.55 to $7.25 at the end of July 2009. It did not have the stimulating effect that Professor Krugman assumes. Teenage employment fell 1.5 million after that increase, as compared to the 1 million that teenage employment typically falls at the end of summers that do not have minimum-wage increases. Total employment also fell more than the usual seasonal patterns would suggest. I have now run my version of the real business cycle model (some of my academic papers on it are here and here, and I began applying it to this recession about a year ago, such as here and here) for a partial recovery over the next two years. (compare to my previous post of no recovery -- they can look pretty similar, depending on what people expect about the future of productivity growth). My model has no adverse productivity shocks, no shocks to capital markets (these variables just react to events in the labor market), no monetary policy, and no fiscal stimulus. Simply put: I view this as a one (type of) shock recession, and the labor market is ground zero for that shock. This version of the model has a labor market distortion that gets progressively worse for two years (2008 & 2009), at which point it partly reverses itself, although never getting back to pre-recession levels. The model and data are shown below. Note that latest 12 months (4 quarters) of the data were not available when I first began writing about this model. On Thursday, the United States Treasury releases its monthly statement of receipts and outlays. If not tomorrow, the report may soon show that the payroll tax has, for the first time in history, become the single largest federal tax. Although officially known as a “contribution,” the Social Security tax brings in almost as much revenue as the individual income tax, and is catching up. The chart below shows Treasury collections of the two taxes (in order to adjust for seasonality, the chart shows the sum over the previous 12 months). Since the recession began, individual income tax collections have fallen to $890 billion from $1,186 billion, whereas Social Security tax collections (inclusive of the Medicare tax) have increased to $848 billion from $837 billion. 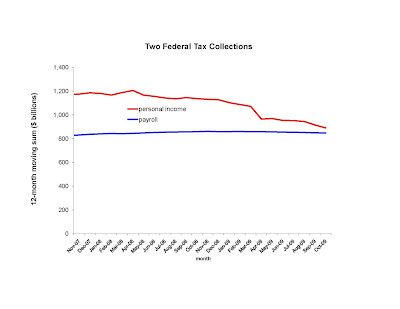 Thus, personal income tax collections have been rapidly falling down to the amount collected in payroll tax. European countries have long been familiar with having the payroll tax as their primary tax. France, Germany and Greece — to name a few — collect significantly more in their payroll taxes than they do with personal and corporate income taxes combined. Several western European countries are (deservedly, or not) known for their generous safety nets and heavy tax burdens, but they have no monopoly on payroll-tax primacy. The Czech Republic’s government is known for its free-market orientation, and it collects almost twice as much from payroll taxation as it does from personal and corporate income taxation combined. That raises an interesting question for the United States as it considers a larger, and perhaps European-like, role for its government. Will it be Democrats who first harness the revenue-collection power of the payroll tax? Or will Republicans appreciate its favorable incentives? Women were 49.86% of payroll employment in October. Total October payroll employment was over 131 million (a revision of last month's report -- I said total employment had to get below 131 million before women's share passes 50.0%). Both the household and establishment surveys shows total employment flat. I found the household survey result interesting because it had dropped so much in just a few months -- now it seems that we can rule out the possibility that Sep or Oct were aberrant -- seasonally adjusted household survey employment really was down over 1.5 million from the summer. Teen employment was flat -- another reason to believe that their very steep drop from summer to fall was real. Why are Durable Goods Suddenly So Expensive? 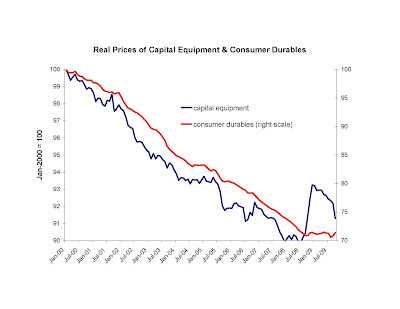 The graph below shows monthly price indices for capital equipment and consumer durables, though Oct 2009. Economists know well that these goods have steady gotten cheaper over time. The mystery to me is that, beginning last September, they stopped getting cheaper and even got more expensive (note that the consumer durable price is on a different scale -- it has tended to decline a lot over time -- so the lack of decline is more remarkable there). volumes produced of these goods are obviously down, but that has been true in previous (ITC-less) recessions and those recessions did not have such price increases (note that my graph includes the 2001 recession). So I don't think the high prices can be blamed on the low volumes alone. For some items, one might be concerned that the price indices are based on "list prices" and those list prices have (perhaps) been discounted more heavily than usual. I am dubious of a significant "list price" bias because the increases are across broad categories of consumer durable goods, including things like cars, college textbooks, jewelry, and telephones where this bias is either less of an issue OR the BLS is measuring actual transaction prices by acting as would-be purchasers themselves). Also note that most of the measured sub-index increases are nominal -- I doubt that manufacturers sought to discount their goods by first hiking their list prices. The ITC is known as the "Investment Tax Credit" -- a credit going to the purchaser of a new durable good. The federal government used it in some of the 1960s and 1970s recessions, but not in the 1980s and 1990s. Professor Goolsbee has convincingly shown that the short run effect of the ITC is to make durables goods more expensive, rather than encouraging investment in them. "Cash for Clunkers" was a kind of ITC -- a subsidy going to purchases of new cars. I have warned for a while now that investors may be rationally expecting further ITCs. I raise all of this because the expectation of future ITCs may explain the price pattern in the chart: producers of durable goods are holding back production until those credits are in place? Anyway, the point of this post is to hear your ideas, not to insist on the ITC interpretation. Recent experience with municipal sales and income taxation serves as a reminder that competition among governments benefits their “customers” — us. The Cook County Board’s president, Todd H. Stroger, told voters that the county badly needed the revenue. Republicans attributed the increase to county government control by “tax and spend” Democrats, but both explanations raise the real question: Why was 2008 suddenly the time to have such a high sales-tax rate? Governments almost always “need” more revenue, and Democrats have dominated county politics for a long time. For some reason, the board president and his supporters once thought that a sales-tax rate less than 10 percent for Chicago was O.K. Changing migration patterns are part of the explanation. Over the years, Cook County had been competing with nearby areas for citizens. Joliet, Naperville and Aurora are each less than 50 miles away and have grown toward a combined one-half million people. Since 2006, however, the rate of migration out of Cook County has dropped 17 percent. The recent migration pattern is quite different from what it was during the 1980-82 recession, when Cook County lost population at a particularly high rate. This recession’s housing crisis has created a significant obstacle to those who might move out of Cook County and other large metropolitan areas: It’s difficult to sell a house. Until housing markets get significantly better, it looks as if Cook County will have a captive audience. With a captive audience, governments can tax at higher rates with less concern for an exodus by taxpayers, and that’s why Chicago’s 10.25 percent tax has not been created the out-migration that it would have five years ago. The sales tax is not the only public policy that responds to competition among government institutions. Suburban public schools are thought to be more efficient because they are compared by parents and homeowners with schools in nearby districts (see the Stanford professor Caroline Hoxby’s research on school competition and school efficiency). Perhaps the data will someday show that the housing crisis was associated with worse results from public schools, too, thanks to this same audience captivity. It appears that yet another legacy of this recession may be to render municipal taxpayers as second-class citizens. Nonresidential capital and employment are "complements" -- when people are working they need a place to work and equipment to work with efficiently. When our workforce was 138 million, we needed more investment in the non-residential capital stock, which had been starved thanks to the housing boom. But with employment down almost to 130 million, that situation is changed. How low non-residential investment gets depends on how low employment gets. Thus, this morning's news that non-residential construction is down yet again I take as a reliable indicator that employment is not coming back soon.